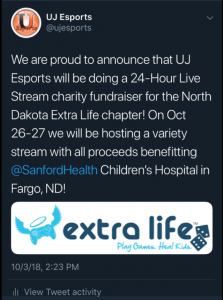 We are so happy to welcome the University of Jamestown’s Esports team to Extra Life! Esports is a form of competition using video games and the University of Jamestown started a team just last year. They are a member of the National Association of Collegiate eSports (NAC). Not only do they love gaming but they are so excited to game for a cause. UJ Esports will do 24-hour live stream charity fundraiser on October 26-27.